Beauty Products My Husband Likes | Dry Skin Edit. The great thing about my husband, Blake, is he’s the ying to my yang. I’m high-strung, he’s mellow. I’m a ‘realist,’ he’s a positive thinker. I have oily skin, he’s perpetually dry. This makes for an ideal beauty blogging situation. Whether it’s products that get kindly sent to me that just don’t suit my skin type or things I buy personally that end up irritating my skin, he’s my go-to guinea pig to see if it’d work better for a different skin type. Over the years, he’s learned to appreciate my love of beauty, and thus has found a couple products he really likes and asks me to replenish whenever there’s a sale (oh, he’s frugal; I’m the spender lol). 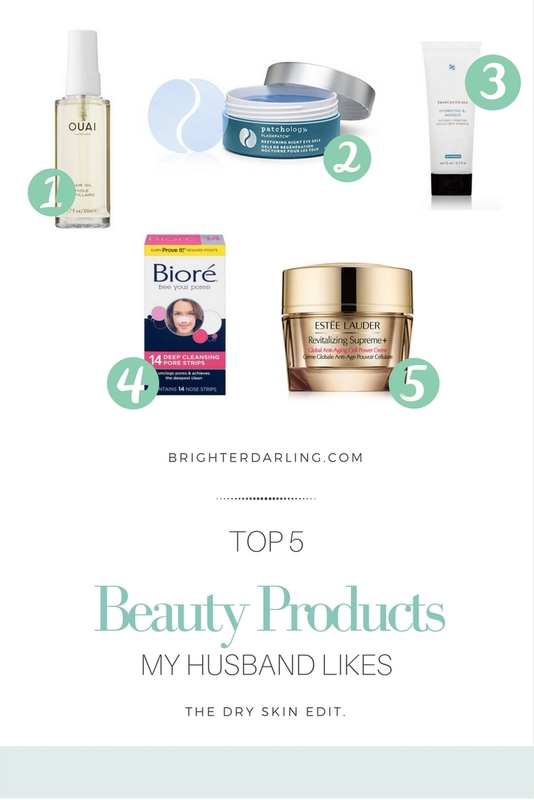 Today I’m sharing five beauty products my husband likes. If you’re more on the normal/dry skinned side, I hope you enjoy! In the deep of winter, Blake was complaining how dry his scalp felt and he didn’t know what to do. I raided my arsenal of products and told him to run a bit of this hair oil through his head and almost instantly, he felt relief. He was shocked how quickly it made the itchy dryness go away without being greasy/heavy on his fine hair. Blake’s had crow’s feet since he was basically six years old. He’s got one of those squinty smiles and although I tell him he needs to use eye cream, we haven’t quite got there yet. Instead, I have him use these eye gels once or twice a week and he notices a big difference in the crepiness of the skin the next day. One of his favorites, this thick hyaluronic acid mask does wonders for dry, dehydrated skin (it’s also a favorite of mine, too, for hydration). Blake says when I make him use this (keyword: MAKE), he feels like he doesn’t even need a daily moisturizer for a few days afterward. These he asks for by name. I think I first had him try these ages ago when we were engaged and getting “wedding ready.” Even though he’s dry skinned, he found it awesome how the pore strips can remove gunk you didn’t even know you had in your skin. I mean, who doesn’t love a good pore strip!? Because I freelance for Estee Lauder, I got this moisturizer in gratis for fall training last season. I immediately knew it would be too hydrating for my oily skin, but Blake loved it the first day he tried it. He swears no other moisturizer I’ve brought home/or got sent to me works better. He also loves the light, fresh fragrance (some others smell too ‘girlie,’ he says). Let me know if you’ve tried any of these and like them, also. Perhaps this list will help you introduce some new products to the special men in your life who are clueless when it comes to skin care/beauty!are you following me? "Product To Try: Glossier Generation G Matte Lip Balms"
"A Few New Makeup Items | Beauty Haul"